Well, as we enter 2019 the situation is worse and those in the know are preparing for a recession so may I suggest you prepare likewise. Get out of debt as quickly as you can. There is much political turmoil across the world; the battle between globalism and nationalism is on centre stage and nationalism has clearly gained the upper hand. There are many internal and external international conflicts going on at the same time, and even more agendas. VENEZUELA: In the first few weeks of 2019, the US recognised the Venezuelan opposition leader who, along with the Venezuelan parliament, declared the current leader Maurado a usurper and himself to be the legal and rightful leader of the country. GREECE: Greece is edging toward political uncertainty with the Macedonia agreement which is being rejected by various factions and is resulting in many internal conflicts. 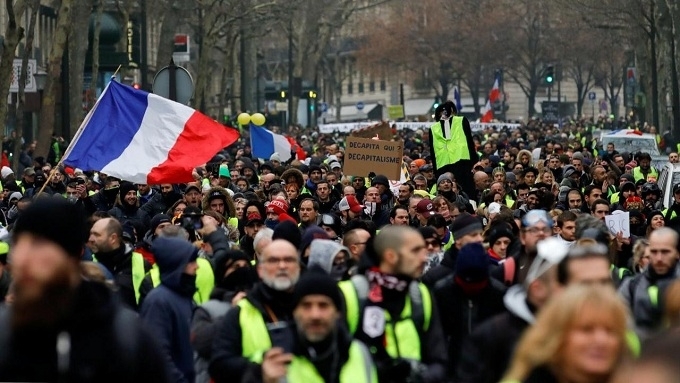 FRANCE: French citizens have been demonstrating in mass for the last nine weeks and the government has capitulated to their demands. ITALY: Italy ignored the EU and passed a budget which the EU condemned. MIDDLE EAST: US sanctions on Iran is crippling the economy and could trigger drastic action. Israel has been carrying out military strikes on Iranian targets, and there is mass public unrest and demonstrations against the Iranian government. The US withdrawal of troops from Syria may only embolden Iran to step up its hostile actions. Beginning with Trump recognising Jerusalem as the capital of Israel and moving its embassy there, tensions in the middle east have escalated with direct missile attacks on Israel by Iran from Syria, provoking a stronger response from Israel. Iran sponsored attacks by Hezbollah from Lebanon and Hamas from Gaza will only heighten the tension and bring on the prophesied war in Daniel 8. For more on this, I suggest Mark Davidson’s book Iran’s Great Invasion. CHINA: China has declared war on both its Christian & Islamic populations, attempting to eradicate these faiths, and if they deem it necessary, even the citizens who hold them. China’s growth estimates don’t look good and are getting worse. They are clearly losing the trade war and its about to get a lot worse for them. Quite simply, 90% of China’s GDP comes for exports, so the US affecting 90% of their trade with our country and exports account for only 15% of US GDP, thus China is only affecting 15% of our trade with them. No matter how you look at it, the US easily wins any trade war between China and the US. RUSSIA: The Russians and the Chinese have been pushed together into an uneasy alliance, something the US has always tried to strategically prevent. The US has always attempted to work with China against Russia or Russia against China. President Trump tried to do this with Russia to prevent an ever aggressive China from gaining more ground, but was prevented from doing so, by Congress and the inept Mueller investigation. The current world situation, with an unprecedented economic crisis, governments now unable to resolve the mounting political unrest, increasing God ordained natural disasters, apostasy in the church, all indicate we are in the Biblical prophesied “end times” Can I suggest you prepare for Jesus return by going to my other website http://www.powerpointsermons.net and download the Power Point Sermon Are We Ready for Jesus – How to Prepare for His return. Further to my previous post which looked at who owns global assets, this post looks at the appetite for investment and the fact it is heading into panic territory. The Global Risk Appetite Index compares the performance of 64 global assets to judge how willing or unwilling investors are to take additional risk. 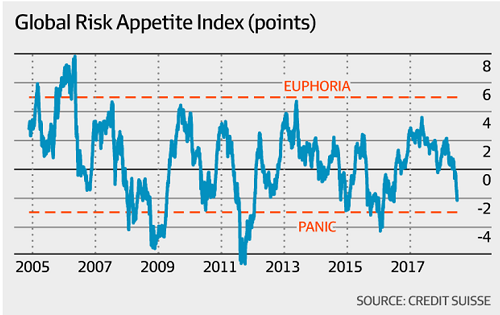 The index last entered panic territory in October of 2015, when global recession seemed a threat as China’s capital markets threatened to meltdown. This time around, the issues are manifold: trade disputes, the Italian budget, Fed tightening and emerging market turbulence all “contend to be the main driver of this risk appetite slump”, the Credit Suisse analysts write. It shows that some very big guns are starting to cut exposure to stocks. Church are you preparing for what’s coming? It will be church as described in the Book of Acts that will be a blessing. 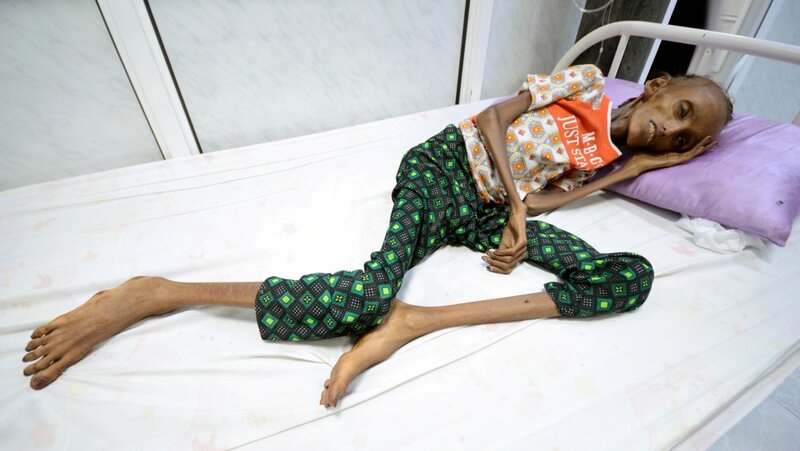 The famine in Yemen in the spring of 2017 is threatening over 7 million people; over 3.3 million children and pregnant or lactating women suffer from acute malnutrition. Over 100,000 affected children are in Al Hudaydah Governorate with the city of Al Hudaydah worst affected area of the province. According to the Norwegian Refugee Council the famine in Yemen will soon reach “biblical proportions”. The famine is being compounded by an outbreak of cholera which is causing 5000 new cases daily. Not just Yemen, the world faces the largest humanitarian crisis since the United Nations was founded in 1945 with more than 20 million people in four countries at risk of starvation and famine, the UN humanitarian chief has said. Stephen O’Brien told the UN Security Council on Friday that “without collective and coordinated global efforts, people will simply starve to death” and “many more will suffer and die from disease”. He urged an immediate injection of funds for Yemen, South Sudan, Somalia and northeast Nigeria plus safe and unimpeded access for humanitarian aid “to avert a catastrophe”. 1. DECEPTION BY FALSE MESSIAHS. 2. BLOODSHED, WARS & CHAOS. 3. FAMINE AND ECONOMIC COLLAPSE. 7. JESUS RETURN IN THE CLOUDS WITH ANGELS. LONDON – When the banking crisis crippled global markets seven years ago, central bankers stepped in as lenders of last resort. Profligate private-sector loans were moved on to the public-sector balance sheet and vast money-printing gave the global economy room to heal. The China slowdown has sent shock waves through commodity markets. The Bloomberg Global Commodity index, which tracks the prices of 22 commodities, fell to levels last seen at the beginning of this century. Billions of dollars in loans were raised on global capital markets to fund new mines and oil exploration that was only ever profitable at previous elevated prices. The great props to the world economy are now beginning to fall. China is going into reverse. And the emerging markets that consumed so many of our products are crippled by currency devaluation. The famed Brics of Brazil, Russia, India, China and South Africa, to whom the West was supposed to pass on the torch of economic growth, are in varying states of disarray. As central banks run out of silver bullets then, credit markets are desperately seeking to reprice risk. Interest rates have been held at emergency lows in the UK and US for around six years. The U.S. is expected to move first, with rates starting to rise from today’s 0 to 0.25 per cent around the end of the year. Investors have already starting buying dollars in anticipation of a strengthening U.S. currency. U.K. rate rises are expected to follow shortly after. Borrowers have not factored in an interest rate rise and will be caught out. The U.K. stock market is in its 77th month of a bull market, which began in March 2009. On only two other occasions in history has the market risen for longer. One is in the lead-up to the Great Crash in 1929 and the other before the bursting of the dotcom bubble in the early 2000s. U.K. markets have been a beneficiary of the huge balance-sheet expansion in the U.S. US monetary base, a measure of notes and coins in circulation plus reserves held at the central bank, has more than quadrupled from around US$800 billion to more than US$4 trillion since 2008. The stock market has been a direct beneficiary of this money and will struggle now that QE3 has ended. In the U.S., Professor Robert Shiller’s cyclically adjusted price earnings ratio — or Shiller CAPE — for the S&P 500 stands at 27.2, some 64 per cent above its historic average of 16.6. On only three occasions since 1882 has it been higher — in 1929, 2000 and 2007. Back in 2003, the world’s most famous investor, Warren Buffet, famously called derivatives “a mega-catastrophic risk”, “financial weapons of mass destruction” and a “time bomb”. Our Australian banks exposure to derivatives is also of concern at 5 times their asset value, particularly NAB and Westpac but nothing like the USA big banks at 50 times. 2016 is the year the big banks will topple. Trump says you heard it here. Those that know God and His Word, know the times we are living in, so should not be surprised at these coming events. It is a a time for the church to reach out to their communities, as did the early church (Acts), when persecution came. A time for fasting and prayer, to seek God on what you need to do, to prepare for this USA banks triggered economic collapse. It will impact Australia and the rest of the world. Making dire and what appear to be apocalyptic predictions on the future of Australia contrasts with my normal optimistic disposition. However, after a decade of research and analysis, the reality is what it is. There’s no point trying to gloss over the overwhelming evidence that we are in the midst of the greatest debt crisis in history by saying ‘she’ll be right mate’. Of course, this would be a far more comforting message, but one that would be highly irresponsible. Government, institutional economists, real estate agents, share brokers and financial planners are not going to tell you anything other than ‘she’ll be right’. Why? Firstly, I think the majority have absolutely no idea how we have arrived at this point of no return. They think going deeper and deeper into debt is normal. After all this is the way it has been for all their adult lives. They point to the world’s recovery since 2008 and genuinely think central bankers have figured out how to save the world with printed dollars. Why worry? The Fed has our backs. In simple terms, they are clueless. Secondly, and I think far more immoral, are the minority that realise the system is a giant Ponzi scheme but have no intention of revealing the economic fraud and endangering their capacity to milk this sham for all its worth. The insiders have their parachute strategy in place and will have taken the necessary precautions to protect their wealth while the masses (as usual) suffer the horrific financial consequences. The Australia of my childhood is a world away from the Australia I see today. We have embraced the great Australian dream of property ownership (plus a few more rental prop¬erties thrown in for good measure) irrespective of the level of indebtedness this ‘dream’ requires. More credit is used to furnish the ‘dream’ with the latest mod cons, pool and land¬scaped yard. Gone are the backyard ‘test matches’ and rugby league ‘grand finals’. The bank managers of yesteryear were prudent and not afraid to say ‘no’ to those they considered less than credit worthy. Since the 1980s the banking industry has prospered more than any other sector of the economy. The simple formula for the banks’ success has been fractional banking — the ability to charge interest on money that does not exist. The proliferation of ‘funny money’ has been a game changer for the banking industry. That’s why the big four banks occupy the top five places in the All Ordinaries Index. The once honourable profession of banking has been reduced to an industry of ‘product floggers’. The bank managers of old who failed to adapt to this new aggressive approach of meeting sales targets, were shown the door. This new age banking model may be highly profitable, but it has also made the financial system highly vulnerable. When the next crisis hits and banks buckle, questions are going to be asked as to how we let this sector become so dominant. Sorry, but this will be too little, too late. The bank execs who oversaw this flawed business model have taken their bonuses and run. With three adult children of my own, I often reflect on the differ¬ence in my starting position at their age. Housing was far more affordable based on a multiple of household income, there was an abundance of employment opportunities, and we didn’t have student loans. By comparison, life seemed a little easier. Ironically I feel the coming collapse will, in the fullness of time, be seen as a positive for the younger generation…the ones who are not overly indebted with loans for overpriced houses. Hitting the reset button on the global economy may, in the longer run, produce a couple of obvious positives. Property becomes more affordable. And a culture of prudence and respect for money is restored to society (much like my parents had from their experiences during The Great Depression and the Second World War). The continued accumulation of debt over many decades has influenced government entitlement policy, financial markets, economic growth and our attitude toward money. Nearly every aspect of our lives has in some way been directly or indirectly impacted by a multi-decade long credit-fuelled consumption binge. For example, would we have so many factories in China pouring out tonnes of pollutants if we in the western world had acted with restraint in our purchasing habits? Probably not. Indirectly, climate change is a result of our love affair with debt. To combat climate change, governments are all now thinking of implementing various (costly) carbon reduction schemes. Perhaps when the next crisis hits, these schemes won’t be neces¬sary, as a good number of the factories will cease to operate. The views I have expressed in this book have been ones I have held for a number years. The risk with publicly stating your views well in advance of a potential crisis is you invite calls of the boy who cried wolf. The more time that passes and nothing happens, the louder the calls become. The one thing I have learnt over the years is that you cannot time markets. Vested interests, powerful media messages and momentum can delay the inevitable outcome for much longer than you might think possible. This is when patience is required. Sir Isaac Newton, to his great cost, learnt this lesson in 1720. Newton invested in the South Sea Company in early 1720 and sold out several months later for a handsome profit. Rather than take his profit and wait for the South Sea bubble to burst, he could not resist the lure of a market that continued to rise. Impatience got the better of him. A few months later he bought back in — at three times his original buy-in price — and the rest as the say ‘is history’. The bubble burst and Newton lost his life savings of 20,000 pounds (about $3 million in today’s dollars). The GFC was warning us of the madness of continued debt accumulation. The central bankers drowned out this message with printed dollars and suppressed interest rates. Once again the market will call time on this madness. Next time the message will be so loud and so clear central bankers will be rendered impotent to stop the market from doing what it should have done in 2008. Yes, I have been early on my forecasts. So be it. The Fed has paid an extremely high price to buy seven years of ‘calm’. I did not anticipate this level of intervention…it has been, like a lot of things since 2008, without precedent. Investing in cash is the equivalent of Noah’s Ark. When the markets wash away all in front of them, your Ark of cash will float above the flood that rages below. But you must build your ark before it rains. They mocked Noah, but he had the last laugh. Take the time now to get your house in order. Follow some simple rules. If you have debt, make a determined effort to pay it down more quickly than you otherwise would have. Do your budget, and learn to live within your income. If you have investments and/or superannuation, move at least some, if not all, into cash. Take profits voluntarily now rather than be forced to realise losses later. Above all, be patient. These things can and do take a long time to play out. Above all, be patient. These things can and do take a long time to play out. Finally, I hope this book has been of assistance to you in formulating your strategy to not only survive but eventually prosper from The End of Australia. As dire as the current situation is, I believe the end will pave the way for a new beginning. An Australia that’s not addicted to debt. A nation where our children and grandchildren no longer have to bear the burden of our over indulgences. VERN, YOU NEED TO UNDERSTAND, THAT UNLESS THIS NATION REPENTS AND RECOGNIZES GOD’S SOVEREIGNTY, JUDGEMENT WILL COME.